A sermon preached at Christ Church Seikokai, San Francisco, on the Feast of the Purification February 2, 2014, by Christopher L. Webber. I want to talk about some niches that need filling one way or another. 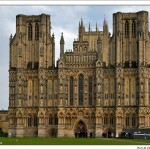 So take a look at this picture of Wells cathedral. This is the west front of a not-untypical Gothic cathedral with row over row of niches usually filled with statues of saints and Biblical figures. 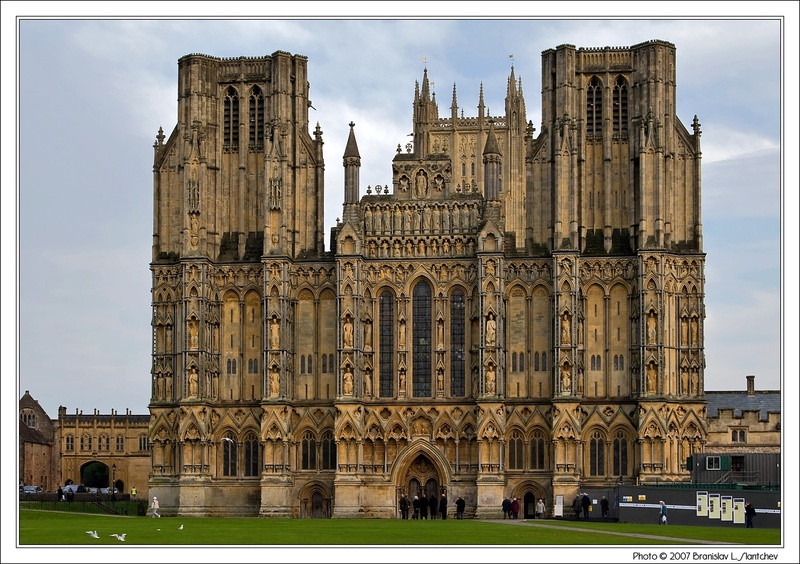 Here at Wells as in many other English cathedrals, you may see a good many empty niches because in the uproar and tumult of the Civil War in the seventeenth century some zealous reformers decided to remove the images of Biblical heroes and legendary saints, knock them down, break them up, and they have remained empty. So you see the empty niches along the bottom, just the ones they could reach without too much effort, and one actually very high up – maybe never filled? Now what this is all about is this: I want to suggest that we look at this morning’s readings as three niches filled and then I want to suggest that we might think in terms of a fourth niche that’s still empty – “space available” as they say in advertising. Actually, you could probably approach every Sunday morning that way: you will hear three readings, three perspectives on God’s way with us, three perspectives raising that same question: if God worked in these lives or these situations in this way, how does God work in my life and my situation? I suppose you could think of it also in terms of a triptych, three panels showing three related scenes and perhaps you could imagine a fourth panel still blank. What do you call a four panel triptych? a quartych? Anyway, we have three readings, three panels, three niches to look at and they have to do with expectation, experience, and understanding: the experience of God’s people in the past, the expectation of God’s intrusion in human life, intrusion in this world, intervention in human affairs, and the reality of God at work here, and then the understanding of God’s purpose and God’s way with us. The experience, expectation, and reality, human desires and God’s purpose – which are not always the same thing and, to be honest, don’t always separate neatly into three niches quite as neatly as we might like. Preachers are always looking for three points and God doesn’t always provide them, but we do our best with what we have.. So look at the first niche: expectation. Niche One comes to us from about 500 BC – 2500 years ago – give or take a century or so, but who’s counting? It’s a period in Jewish history of frustrated expectations. You know about frustrated expectations? Maybe you had high hopes for President Obama and are feeling frustrated that the result has not met or exceeded expectations. Now, you could argue that actually a lot has been accomplished – finally, after sixty years, a national health plan, for better or worse. But many of those who wanted a national health plan had great expectations and the reality so far is rather different so there’s a lot of frustration. I’m not taking sides but just wondering whether we can get a feel for a society 2500 years ago. the big rock candy mountain of Jerusalem. I’ve only been eight months away from Connecticut where we had twenty acres of land on a dirt road but looking back I remember how it was that wonderful place where I could pick apples year round and cut asparagus whenever I was hungry and the snow was soft and fluffy and almost warm to the touch and it never rained when I needed to go somewhere! Now you may tell me that San Francisco is really the big rock candy mountain and for sure the snow and the rain don’t fall on us here and if I got exiled to New Jersey or Atlanta I might begin to imagine San Francisco as the new Jerusalem. But anyway, the Jews in Babylon remembered Jerusalem as super-wonderful. And at the center of their imaginary remembered city was the temple in Jerusalem where it was always Passover and Hanukkah and never Yom Kippur and the incense never made you sneeze and the menorah candles never burned down. So here’s the picture for the first niche, panel one of the tripych: I actually can’t carve it for you myself because you would need the skills of a Rodin or Epstein or for the triptych the skills of a Picasso. I’m thinking of Picasso’s Guernica – the most terrifying modern imagery I can think of: people covering their heads in fear and horror. Like that, Malachi tells us, In sudden terror, God will come – so watch out! Like a refiner’s fire or like fuller’s soap. Two very different images but both concerned with burning and beating things into shape. If you have silver or gold that isn’t pure, you can burn out the impurities with a very hot flame If you have freshly woven clothe that’s picked up bits of stuff in the process you can use an alkali solution to purge it. God, in other words, will not be focused on making life nicer for you but on making you nicer for life. Why are things not what they used to be? Maybe you aren’t what you ought to be. So start there – and be prepared, because God will come and you may be the target in God’s agenda. OK, let’s look at the second niche, second panel: this is actually the third lesson. We always read the three lessons out of sequence. In historical terms, the epistle comes after the gospel. So the gospel tells us what happened. Malachi said the Lord would come to the temple unexpectedly and look what happened. Not a cataclysm but a baby. You want God to come? So God came – and Malachi was dead wrong. Well, no, not completely wrong. God did come and what happened was surely unexpected – but not an apocalyptic drama – just a mother and child, coming to the Temple to carry out the traditional ritual on the fortieth day from the birth of the child. We need to think about that for a minute. Why do we have prophets in the Bible who got it wrong? Well, a prophet is one who speaks for God when God wants to send us a message. And God sends us messages through human intermediaries who have their own agendas. God doesn’t just take over the prophet and use him as a robotic mouthpiece: that would be a medium – someone who just passes on messages with no input. But God respects the prophet’s integrity just as God respects the prophet’s language. I don’t know whether God always speaks Hebrew but if you want Malachi for a messenger, it has to come through in Hebrew. If you want me for a preacher, it’s going to be in English because my knowledge of Japanese isn’t up to it. If I had to preach in Japanese, it would be a very short sermon. But there are things I could say in Japanese that I can’t say in English, like: Wasuremono o wasurenaide kudasai. There’s no equivalent to that in English. More important, there’s no future tense in Japanese, so I can’t say, “I will be here next week” only “I hope to be, I plan to be.” So a Japanese Malachi couldn’t say, “The Lord whom you seek will come . . .” He can only say, “He plans to come, he’s likely to come, he hopes to come . . .” But he can’t say, “He will . . .” And that limits the messenger and it limits God because God can only give us messages that we’re capable of hearing. So Malachi couldn’t imagine a sudden dramatic coming of – a baby. Sudden and dramatic, he got; but not the baby. Some of us haven’t quite figured it out either. So what we have in the second niche, the Gospel niche, is what actually happened. In niche one we had a prophet trying to communicate but he couldn’t quite hear what God was saying. And God couldn’t quite get the message through because even the prophet couldn’t hear it – couldn’t hear the full message. The message is that God will suddenly come to God’s people. And the people generally can’t hear it – they don’t even really want it – they just want their festivals back with all the old-time trimming. Why would they want God to intervene in that? Why would Christians want God to get involved in the way we keep Christmas? Hard enough to get presents for everyone without having to think about serving God. So Malachi got a message: God is coming, suddenly, unexpectedly, drastically. Malachi got it and passed it on, but as it passed through him it changed. Malachi read it as world-shaking in human terms: a sudden, drastic shaking of society and who could disagree that that was needed, who could disagree that it IS needed. Malachi knew it, we know it – but God operates on a different schedule. Yes, something drastic is needed. Yes, we need to be shaken, Yes, we need to be refined and purged. But Malachi’s people were obsessed with what used to be. And Malachi was obsessed with what could be. And we’re not obsessed at all. Do we have a vision we’re committed to, that we support as our first priority, that we ever even mention to others? But look what happens, look what God does: drastic, yes; unprecedented, yes; transformative, yes. Put it in the second niche: a human infant, a child to be subject to human laws and human conditions, to be presented in the Temple like any other child. Here, God, take this child and use this child for your purposes. Remind us that you did and can and do come into human lives and use them to change the world. So we have Niiche One: the Prophet. And Niche two: possibly a young woman holding an infant. We’ve all seen that statue, that image on Christmas cards and even postage stamps to the point that we’ve forgotten what a radical, unexpected, life-changing message it sends: God comes, where we expect it least. As a child in a manger, as a man on a cross, God comes. Niche three: same subject: God coming among us but the Epistle to the Hebrews is looking back, not forward, looking back to what really happened when God did come and trying to put it in perspective, trying to understand it, trying to bring it into a focus that we can look at and understand. Here’s an author, a sculptor, who sees that a one-time tsunami is no solution – sure, God can come and purify the temple, sweep it clean, get rid of the mold and the muck with a lasar beam, a nuclear explosion, a raging fire – choose your imagery – but what really needs doing is a much longer, slower, quieter process – one by one by one by one – the transformation of the human race, one by one, beginning with one. He had to, the author tells us: “He had to become like his brothers and sisters in every respect, so that he might be a merciful and faithful high priest, and because he himself was tested he is able to help those who are tested. God is no remote, unapproachable being. God has been here, God is here, still at work in the sacrament and in your life. There are Christians still who look for the sudden, dramatic, born again moment, and some probably need it, but what matters in the long term is a much quieter, persistent faithfulness, much less dramatic, much less a Malachi moment than a Mary moment that happens, needs to happen, because God took the unexpected initiative and identified with us, here, flesh and blood, here, bread and wine, here, in us and working through us to continue what began in those unobtrusive events that changed the world. So the third niche holds a teacher, an interpreter, a figure holding a Bible and pointing to the words we need in order to understand. And then the fourth niche, the fourth panel of the triptych, quartych, is for us. Actually there are lots of empty niches left for us and they need to be filled with all sorts of people so that others can look up and see that indeed lives can be changed not by push or by pull, not even by forcing our way into the empty space on the cathedral front but by opening the door to the empty space in our hearts and minds, opening the door to that same quiet, unexpected event that began to change the world when Jesus was born and presented to God in the Temple and when at last he is born again, present again, in every one of us. Hi Chris – Thank you for a thoughtful, well-crafted and interesting sermon. I liked your humor and good sense. I yearned for specifics. You aren’t what you ought to be. Some concrete examples of what people are not and some examples of what we people ought to be. People are grasping for money when they really have plenty. We could pay more taxes. Why would we want God to be involved in the way we keep Christmas? Examples would have given us something concrete. We celebrate greed now. We could celebrate by urging government to help crippled veterans more. What is the radical message of the incarnation? Specifically? Our bodies are very important to God and to us. We are called to a quieter, persistent faithfulness. Specifically, how do we nurture that vision? Praying with a sick friend. Visiting an elderly person who has no company. I can follow a preacher who has a main theme, sticks to it and illustrates it. We do not want to be in a niche on a cathedral facade. We want to live excited in the world today.